Hi, I would like to enquire about having someone come to look at my basement and foundation. It looks like there might be water damage and/or mould problems. Hello, I have a seller client who is in need of a crawlspace system - could you please contact me to see how soon you'd be able to come and quote on the work required - many thanks. Our basement has water seeping in through what seems to be the edge of our basement floor in the one corner. It was poring in last night. I have a damp crawlspace with a clearance of between 2 feet and 6 inches. Rodents have had theyre way for awhile down there. I may need the old moldy soil and debris escavated out of there so it can be properly sprayfoamed, encapsulated, made rodent free and healthy for my children. It does not need to be escavated to a usable space. Only to a point where it can be repaired, encapsulated and maintained. The area is approx 80' by 30' and has at least 2 internal foundation walls beside the outside foundation. I do not provide a phone number in the beginning. I hope you understand. Recently bought a 20 year old cottage, for 20 years basement was wet, we have dried it out, but believe the center beam is now sagging (or was always sagging but now sagging more). Interested in options to extend it's life or replace. Our pool deck has several large cracks and uneven concrete. Large concrete area that I would prefer not to remove and replace new. It would be too expensive. Looking for a cheaper way to fix and repair the pool deck. I am writing to see if i could get a free no-obligation quote for doing our crawl space on our home. We moved to our current home the end of July 2014. The home was built in the late 1800's, has been extensively renovated and has a new addition. The basement is mostly dirt crawlspaces, but it is dry. It smells musty in our home and all the new windows have condensation on them. Can you help? Absolutely delighted and ABS has impressed us from the start to finish... Your Team is a class act! "Justin Fysh and his crew Super, wonderful Group of guys..."
"Trevor was quick and efficient. He repaired a crack,..."
From start to finish it has been a great experience! Very satisfied. Professional and knowledgeable inspector. We not only adhere to the highest industry standards, we strive to be the industry leader in the home improvement related services we provide. We also use state-of-the-art products and technology which are designed to fix your home. We are the authorized Basement Systems dealer in Goderich, ON. It rained all night and has created a bit of a pond for our crew! Not to worry though as this will not slow them down much. This site will house 43 Model 288 Helical Piers. The drive head which turns the piers into the ground is slipped over the lead and bolted into place. After the helical pier (lead) is turned into the ground, an extension tube is bolted to the top of that lead and is the also turned into the ground. This continues until the required PSI is met. I have a block foundation that is constantly seeping in water through the grout lines. The basement doesn't flood but it's always damp and the walls get noticeably wet after heavy rains. I hope to finish the basement one day and would like to remedy this issue before starting. Back filling pushed the basement wall in cracking the cinder block at ground level and leaving a bowed wall. I would like to remove the old wall and replace with new wall. There is a basement floor drain and septic tank in the area where the repair would occur. Would like to add a basement to my existing structure that is app 1500 sq very sandy soil is this something that you do? House is 40 years old, block foundation. Water is in corner of basement on the side adjacent to the driveway. Water appears to be coming in at surface level from low point on driveway at rear of house. I am guessing the mortar has eroded away and that water is coming in through the interior of the blocks, as there is little water visible on the interior wall of the foundation. It is difficult to get a look at the interior foundation close to where I think the water is coming in because fuse box is located on the wall in the problem corner, which blocks the inside view. 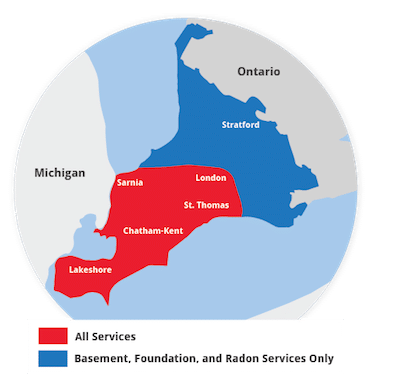 Just wondered if you knew of anyone near Goderich that does foundation work ? Thanks for any suggestions. Would like an estimate on a repair to a cracked,leaking foundation wall in a garage. We would like to set up an appointment ASAP. You can call and ask for Mark today all day or any other day after 12:00 noon.